Today I'm sporting a special treat from Nail Sauce. I saw the birth of this brand on instagram through its creator @feliifel. I've always thought she had a great knack for color mixing and combos. When she came out with the limited edition of Space Junk with only 50 bottles I knew I had to snag a bottle! Space Junk is a gorgeous coal gray jelly base chock full of dark, gold, holo and teal glitters with large holo hexagons sprinkled throughout. It's out of this world! ;) The application was awesome and it took about two layer to be fully opaque, maybe three to be on the safe side. It would look great as one coat over black or just alone. Ooh, can you say galaxy nails in a bottle? My macro shot of Space Junk is what really shines though. Here you can see the rainbow holo effect strewn over the nail and get a more accurate look at what they really appears like on the nail. Awesome job @feliifel! 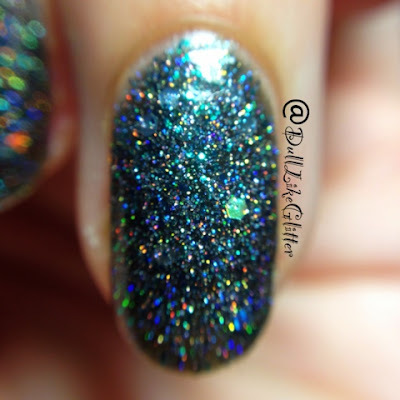 Unfortunately, unless she changes her mind, Space Junk will not be restocked but with a polish this gorgeous you know she's got to have some other great ones. And she does! Head on over to Nail Sauce or www.nailsauce.com to check out more of her fantastic colors.